Let’s just say that Violet’s crew and I have an extensive HISTORY together. Not all of them are as amiable as ol’ Ron here. The following is Ron’s response to my comment HERE and now my responses to him which will constitute the driving thesis of this post. I’m not sure who he’s referring to, but the problem I see is not so much that Christians won’t address the tough issues of our God and His scriptures. The problem I see, is that the answers they usually give, are themselves unbiblical and hence not only elevate man over God but in so doing play right into the unbeliever’s hands. The trouble here, at least in the case of many with solid reformed theology overall, is the refusal to take the God (and man actually) of their theology with them into the arenas of philosophy and apologetics. Please consider the following biblical points that no claimant upon historic orthodoxy should overtly question. Let’s start with the fact that God has no problems. Including ones with evil. Nobody whose opinion anyone should care about is going to assert that anything is an actual “problem” for the God of the bible. (Isaiah 46:5, 8-11, Daniel 4:34-37 among endless other examples) Nothing is unknown or mysterious to Him. He has never learned anything because He’s always known everything. Actual and possible, past, present and future Past, present and future. Past, present and future to us that is. God is not subject to time. (Psalm 90:2 – 2 Peter 3:8). Neither does anything in all His creation escape His flawlessly wise power and providence. He has not only created all things from nothing, (Genesis 1, Hebrews 11:3) but He also sustains their existence every second. (Hebrews 1:3) All of history, to the minutest sub-atomic detail, past, present, and future, is known to and owned by Him. Not because He has discovered it by observation, but because He has ordained it by immutable sovereign decree (Proverbs 16:33, Ephesians 1:11, Isaiah 10, among endless other examples). 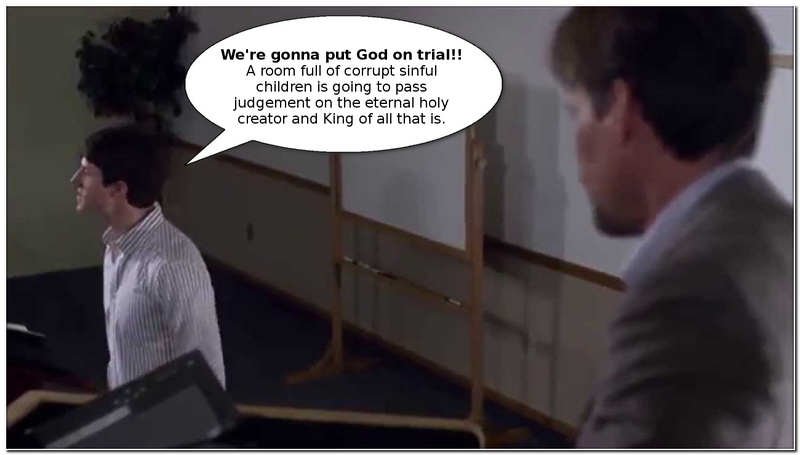 Unlike what we saw in a very unfortunate Christian movie a few years ago, God is not ON TRIAL. However, it doesn’t explain why an all-powerful and all-knowing being would create sinful humans in need of saving to begin with. Is God a sadist? Now we come to the heart of the matter. Right here is where sub-biblical non-reformed apologists (which means the vast majority of the famous ones today) are simply operating consistently with their view of God, and many reformed ones are operating quite inconsistently with what is supposed to be theirs. They will proceed under the assumption that there exists somewhere an independent impersonal standard of good and evil that both man AND God are by definition subject to as they attempt to satisfy the sinner that His creator is indeed worthy of his worship (This is so biblically upside down, I can barely type the words). It is positively monumental arrogance to attempt to get God out of jams He’s not in. The so-called “problem of evil” has been a standard attack in this campaign of unbelief for centuries. The problem with the problem of evil lies in the very fact that it’s seen by the church as an actual serious problem in the first place. The alone true and living God before whom “all the nations are as nothing, and regarded by Him as less than nothing and meaningless,” (Isaiah 40:17) is not the one with the problem. Therefore as His brother, bride and son, neither am I. 33-Oh, the depth of the riches both of the wisdom and knowledge of God! How unsearchable are His judgments and unfathomable His ways! 34 – For WHO HAS KNOWN THE MIND OF THE LORD, OR WHO BECAME HIS COUNSELOR? 35 – OR WHO HAS FIRST GIVEN TO HIM THAT IT MIGHT BE PAID BACK TO HIM AGAIN? 36 – For from Him and through Him and to Him are all things. To Him be the glory forever. Amen. 15-He is the image of the invisible God, the firstborn of all creation. 16-For by Him all things were created, both in the heavens and on earth, visible and invisible, whether thrones or dominions or rulers or authorities—all things have been created through Him and for Him. 17-He is before all things, and in Him all things hold together. 18-He is also head of the body, the church; and He is the beginning, the firstborn from the dead, so that He Himself will come to have first place in everything. 19-For it was the Father’s good pleasure for all the fullness to dwell in Him, 20-and through Him to reconcile all things to Himself, having made peace through the blood of His cross; through Him, I say, whether things on earth or things in heaven. He is God and we are not. EveryTHING and everyONE belongs to HIM. The “problem of evil” rests, as I’ve said, on the fatally flawed assumption that finite fallen man’s definitions of “good” and “evil” simply must also be God’s. God’s standard is Himself. All that He has ever thought, said or done is ultimately for Himself. To display His own perfect holiness, judgment and justice in damning His enemies on one hand, and His own perfect mercy, grace, and love in redeeming a people for Himself from among them on the other. EveryTHING and everyONE has been created by Himself, for Himself. Yes. He can do it and you can’t. God decrees what He forbids and that without in any way being tainted by sin or evil. He renders evil certain without actively willing it. (Proverbs 16:4) How does He do this? I have no idea and it’s none of my business. (Romans 9:19-20) I wouldn’t understand if He explained it to me anyway. Is man free and accountable then? Yes. God’s sovereign decree and providence extend even to the temporal contingency and volitions of the wills of His moral agents bearing His moral image and likeness. It is God’s purposes, sufficient unto Himself that ultimately account for evil in His creation. Not any notion of the “free will” of man that would construe it as freer than God’s. The cross of Christ was not a fix in response to Adam’s sin. Adam’s sin was so there could be a cross of Christ. When I tell unbelievers like Ron that God is all-powerful and can do anything except violate His own being and nature, and yet spotlessly Holy because His own being and nature IS that standard, Ron is SUPPOSED to hate that. (1st Corinthians 1:18-31, 2:14) Unless the Holy Spirit is working life and repentance in Ron, he will find such a notion the most egregious bit of sophistry he’s ever heard. My job is to tell him. Only God can save him. If he rolls his eyes and calls me an idiot, his problem is with his creator and king. Not me. If I have preached God’s truth to him from a heart that loves him and desperately wants him as my eternal brother in Christ, I will sleep well knowing that I have done what I was told. We don’t like that today because it doesn’t sell books, bring speaking engagements and pack conferences. We get the credit for innovative trends and methods. If “all” we do is give sinners the pure simple Gospel truth, we decrease and HE increases. ANY Christian can do that and that’s the point. Being an unavoidable oversimplification of this type of subject matter (despite it’s already being fairly long), this post will probably bring questions and challenges. I will try, to the best of my ability to find a way to answer those as possible and time permits.